President Donald Trump quoted Heritage expert Tommy Binion who was on Fox and Friends discussing how over two-thirds of Heritage's policy recommendations had already been adopted by President Trump's Administration. The Trump Administration's embrace of these conservative policy recommendations is a huge step forward. 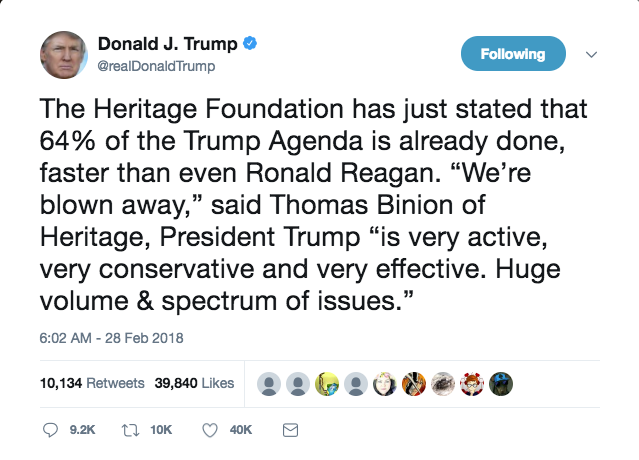 "With unprecedented speed, the Trump administration has already implemented nearly two-thirds of the 334 agenda items called for by the Heritage Foundation, a pace faster than former President Reagan who embraced the conservative think tank’s legendary “Mandate for Leadership” blueprint." "A lot of people are seeing expansions in their benefit packages. We are reaching statistical full employment. The Heritage Foundation today has issued a report saying that 65% of Donald Trump’s agenda has already been accomplished in just one year. There isn’t a president in modern times who got even close to that. The Heritage Foundation reporting that 65% of Trump’s agenda has already passed. Trump is not slowing down." Conservatives must persevere in gracefully countering misinformation from the left that convinces too many Americans liberal policies will improve their lives, the new president of The Heritage Foundation said in a speech laying out her vision for the leading think tank. Heritage billed the speech, entitled “Imagine America: A Pathway Forward for All Americans,” as an outline of James’ vision not just for the leading conservative think tank but for the nation as a whole. 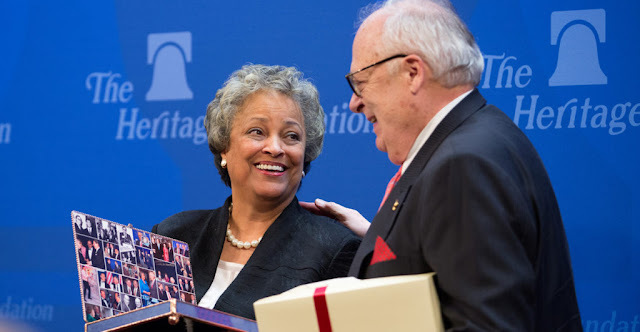 She spoke during an invitation-only reception at Heritage’s Capitol Hill headquarters, where the think tank’s leaders also thanked its longtime president, Edwin J. Feulner, for returning to the helm last year during the search that resulted in her selection. The more than 300 guests included well-known Washington figures such as Attorney General Jeff Sessions, who sat in the front row of Heritage’s Allison Auditorium and moved toward James to shake her hand as she returned to her seat. 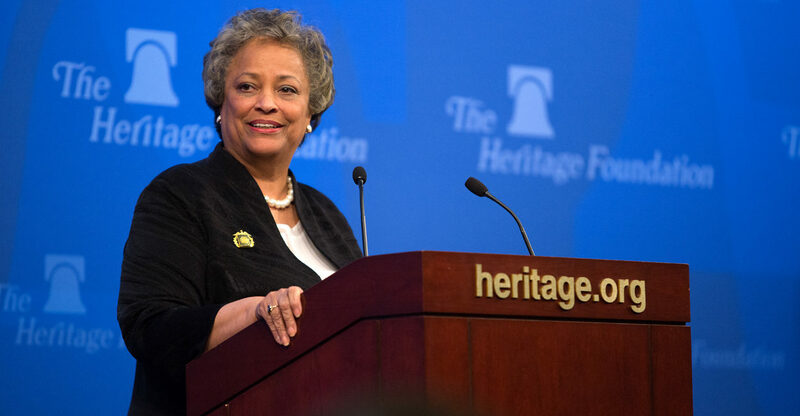 In her remarks, James described becoming Heritage’s president as the culmination of her personal journey and professional career. James has served over three decades in government, academia, and the private sector. She was associate director of the White House Office of National Drug Control Policy under President George H.W. Bush; Virginia’s health secretary under Gov. George Allen; director of the Office of Personnel Management under President George W. Bush; dean of the School of Government at Regent University; and, most recently, a senior member of President Donald Trump’s transition team. For the past decade, she also had headed the Gloucester Institute, a leadership training organization in Gloucester, Virginia. On Jan. 1, she formally took the reins of The Heritage Foundation from Feulner, who introduced her. “I inherited scholars and staff that are the most driven and dedicated team that anyone could ever hope to lead,” James said. A Rasmussen Reports daily Presidential Tracking Poll showed that 50% of Likely U.S. Voters approve of President Trump’s job performance. Forty-eight percent (48%) disapprove.